Looking for good hotels in Putrajaya or Cyberjaya? These twin cities do not have a huge number of hotels but those they do have are of a high quality. 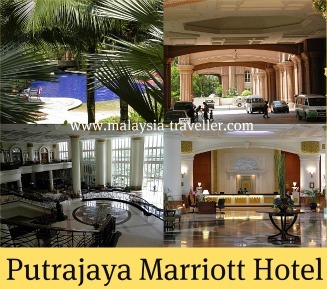 There are half a dozen 4 or 5 star hotels and resorts in and around Putrajaya/Cyberjaya. I have personally visited them all and here are my comments and recommendations. This smart hotel is located within IOI Resort City which is a residential and retail development wrapped around a golf course on the northern fringes of Putrajaya. The Marriott Hotel is an imposing size with a very grandiose exterior and entrance which leads into a cavernous and spacious lobby. Being so close to Malaysia's Federal administrative capital it is well equipped to handle large scale official events, conferences or private weddings. As you would expect there are a number of eating outlets. 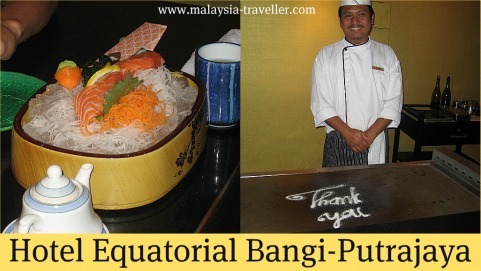 I have tried the Midori Japanese Restaurant which serves some of the best and most authentic Japanese food that we have tasted in the KL/Putrajaya area. On Sundays they have the Oishi Buffet on Legs (not tried that yet but presumably means the buffet selections are offered at your table rather than you having to go to collect it). We also enjoyed the hotel's Tuscany Italian Restaurant & Pizza Bar, a high-end but casual Italian eatery. Meal prices are typical for a hotel of this standard, i.e. fairly expensive! Outside, the swimming pool area looks nice. One of the best hotels in Putrajaya, especially if you want to put on a fancy wedding. 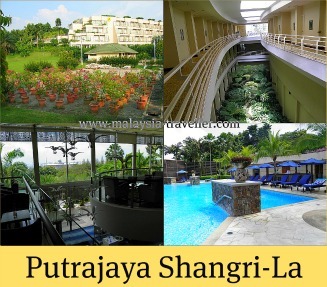 The Putrajaya Shangri-La is an elegant luxury low-rise hotel situated in pleasant surroundings on a hilltop within a leafy park (Taman Putra Perdana) overlooking the heart of Putrajaya. The only other building on the hilltop is Istana Melawati, the King of Malaysia's official residence in Putrajaya. When your next door neighbour is a Royal Palace you know you are staying in a good area! It's a compact, small hotel with only 118 spacious rooms and suites. All its rooms and public areas have a bright and airy feel. Its lovely pool provides excellent views over the city. There are only two restaurants in the hotel which become a bit boring for long-stay guests. There is also no bar apart from the one at poolside. While being surrounded by a park is great for walkers and joggers it does mean that there are no shops or restaurants nearby, although the same is true for all of Putrajaya's hotels. The Alamanda shopping mall, which has plenty of eating outlets, is only 5 minutes drive away (or 15 minutes sweaty walk). If I were visiting Putrajaya or Cyberjaya on a business trip I would probably opt for the Putrajaya Shangri-La which I feel will remain a stylish property for years to come. While the Shangri-La is located next to a palace, the Pullman Putrajaya actuallylooks like a palace. This uniquely designed hotel sprawls over a large area and is arranged in 4 wings each with different themes and decor: Chinese, Malay, Indian and Borneo. Its interior design is modern and trendy. It occupies a lakeside position with great views and boating facilities are available. Its location is at the quieter end of Putrajaya with little of interest nearby except for the Putrajaya International Convention Centre. If attending a conference at PICC, the Pullman would be the most convenient place to stay. I have tried the bar and one of the restaurants (B's). The food and service were OK but nothing special and perhaps did not live up to the stunning appearance of the hotel. This hotel is a hidden gem. It used to be known as Cyberview Lodge but it seems to have lost the 'Lodge' somewhere. It is located in Cyberjaya, Putrajaya's hi-tech Siamese twin. The reception lobby has rich dark wooden floors and subdued lighting providing an immediate relaxing resort atmosphere for the visitor. Behind the reception, paths lead out into the lush tropical landscaping surrounding the free form pool which is the hotel's centrepiece. The poolside has plenty of open grass spaces for kids to play and hammocks and cosy double seater sunloungers for couples to enjoy. Accommodation is made up of chalets and bungalows. I have not seen inside the rooms but I understand they range from large to enormous and most reviews are very favourable. We have had a buffet lunch at the Verandah restaurant which was very good. There is also a Bistro and a newly opened Chinese restaurant. Another new addition is the Karma Bar & Lounge which I tried on my recent visit. The Karma claims to have the 'Best Happy Hour in Cyberjaya'. Well there is not a lot of competition in Cyberjaya so I suspect they are correct. We enjoyed our drink and bar snack there. 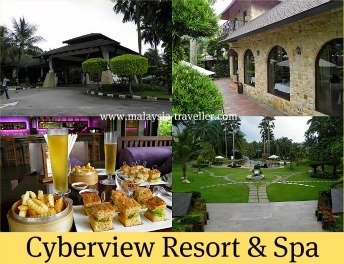 If I were looking for a family break in Putrajaya/Cyberjaya or just with my wife, the Cyberview would be my preferred hotel. Bangi is a township to the east of Putrajaya. It is not far away as the bird flies but Bangi has a very different feel to it than Putrajaya as it is more of an industrial and commercial town. Much of Bangi is scruffy but the Hotel Bangi-Putrajaya is located in the posh part of it next to the Bangi Golf Resort. The hotel has nice gardens with a pleasant pool which, on my visit, was much busier than any of the hotels in Putrajaya. We have eaten a good teppanyaki meal at the hotel's Kampachi Restaurant (since renamed Kazumi). The Palm Garden is also located in IOI Resort, close to the Marriott. It used to enjoy a fine view over the golf course but there is a major redevelopment going on. The golf course has been shifted around to the other side of the resort and a major excavation was created which has now been filled with a shopping mall and tower blocks. As a result, the Palm Garden seems to be suffering from an uncertain future and presumably it will be remodelled as part of the master scheme for the IOI Resort. It has some good facilities including a nice pool. It has an English style pub with darts and pool tables but it is rarely busy. I have tried the Thai restaurant. Good food but service was slow. The spa facilities are not bad. Overall the hotel is looking a bit tired and rough at the edges but retains some character. It may not be one of the best hotels in Putrajaya but if good room rates can be obtained it is worth considering. Since I first wrote this article, the Everly Putrajaya Hotel has opened up in Precinct 16 to provide an additional choice at the 4 star level. This ends my review of hotels in Putrajaya. If you would like more information on any of these hotels in Putrajaya and Cyberjaya, including availability, room rates or to make a booking, you can take a look at Agoda's website here.